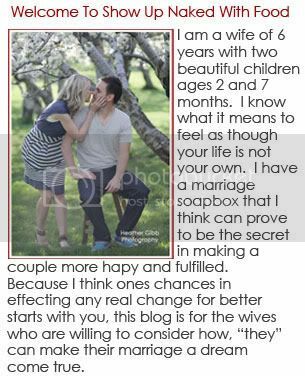 I have had comments from several female readers about the fact that this blog should address more about what men should be doing to make their wives happy. I would love to invite guys to write comments or speak to this- so please send me your thoughts fellas! My intention for starting this blog was to get us wives to stop thinking about ourselves and our version of “the story” and to start thinking about the men we married in order to improve our marriages. If we each really considered how we can better love the other, rather than how we should or ought to be loved by them, there would not be as many broken homes and broken hearts. Victor Hugo wrote beautifully, “Do I exist for my own happiness? No, my whole existence is devoted to her, even in spite of her.” We’d all actually find our own happiness created more easily if we had this attitude of adoration for our spouses. Blame is one of the most destructive aspects of humanity. When I have a “problem” with someone or something it is always a good indicator that it is time for me to take a hard look in the mirror. It is late Friday night, I have worked a 60 hour week and am consequently exhausted and climb into bed talking with my husband about all the things we have to do and take care of tomorrow morning. Tomorrow is Saturday and I have a million obligations and because both my husband and I work and we both share in running the household/taking care of our two boys, we rarely have time for weekend fun these days. I ask him what his day is like tomorrow in an effort to coordinate our schedules and the kids. He doesn’t mention anything in particular. I proceed to tell him how stressed I feel and even overwhelmed lately. He listens politely and we go to sleep. Early in the morning about 6AM or so I am woken up to my husband all decked out in his snowmobiling clothes. He leans over me and kisses me on the cheek and asks if he can go snowmobiling with his friends for the day and will be back at about 5PM that night. I am wide awake and this point and pretty frustrated. Not because he wants to go snowmobiling but because he obviously intentionally didn’t mention these plans late the night before when I specifically asked him. I share with him my confusion and frustration but he and I both know he was just “handling” me. He didn’t want to deal with asking me last night when I was clearly feeling overwhelmed. He wanted to wait until the last possible moment, with his gear adorned and a ride on the way. I immediately start thinking up a series of self justifications as to why I have every right to be upset with him. I am now going to be the BAD guy, and I resent this- so I tell him he can do whatever he wants to do. (WE ALL KNOW WHAT THAT MEANS) If he goes HE’LL be the bad guy so he is left with no choice. He stayed home and helped me with our extensive list of errands. It was a yucky situation and we were both grumpy for an hour or so. My being frustrated with him gave me a hint that I should consider thinking about his reasons. I then engaged in some serious self introspection and realize that I must be the type of wife that he feels he has to “handle” sometimes. I must be difficult to communicate with me sometimes, especially about his desire to get some sporting enjoyment occasionally out of our busy lives (which is another thing a lot of guys need/want...by the way) and certainly I don’t always make him feel 100% safe to approach me when I am verbally vomiting my stressors to him late at night. When I truly considered this about myself I totally got over being upset and actually felt badly for him and focused on how much I WANT him to go snowmobiling on the weekends with his pals. I WANT to make him happy and do everything in my power to allow him life's pleasures. My change in attitude was matched and even outmatched by my adorable husband who came to me apologizing and saying he was sorry for being selfish and he acknowledged me for all that I do for our family and how he wants for me to have a turn to enjoy myself for the weekend. We kissed, hugged, and both apologized profusely. It wasn’t until each of us thought about the other person that our conflict was no more! Some incredibly influential books and teachings about how we can learn to overcome our tendency of having the problem of not knowing WE have a problem have been offered by Arbinger Institue “Arbinger is a worldwide consulting company and think-tank comprised of people who have been trained in business, law, economics, philosophy, the family, education, coaching, and psychology." In their books, they capture the idea of “self-deception” and how all of us get into this pit fall. When we are self-deceived we exonerate ourselves by placing blame or finding fault with others. If we talk about all the wrong others do and how they need to be better we merely use these conversations to justify our own short-comings. However, if we can overcome our self-deception, it often acts as the primary way of helping others overcome theirs. So my sweet lady readers, while absolutely our husbands could improve- since I am not a husband, I am not sure it would be too effective for me to write about what THEY should do. Perhaps I will get some thoughtful men to write more on that as per your requests! Thanks for reading. I am the King of my castle, and the things I feel threatened by are my own mistakes because I feel they judge who I am. I feel like if I have failed one time, I am no longer worthy to rule. I have a way of condensing moments and blowing these way out of proportion. Its not sympathy or absolution I'm after from my wife, its more that I am harder on myself than is necessary. In those moments you can bet I am deflecting blame big time and I don't mean the unkind words I say or the moods I go into. I love my wife and I sometimes forget she is the Queen of our castle. How true this is! When we are feeling frustrated that is when we need to look inside and see what we are doing to cause the frustration rather than point the finger to others. Your story was great and showed how with the right attitude a wife can see that her husband isn't the "bad guy" and that she can change to make things alright. Your husband shouldn't have gone snowmobiling! He now keeps things from you and sneaks out of the house in the early morning hours?! YOU'RE the one who is at fault?! No! This story is all sorts of backwards. Does it appear that you're continuing to focus on HIS every need has gotten to the point where he can sneak out, leave you with all the children and chores, and return with YOU apologizing? It doesn't make sense. To me, this is a result of your idea that you are solely responsible for making your man happy even if it comes at great expense to you. Thanks for the comment Cody. I imagine you are a wonderful husband to Madelyn and you guys are super lucky to have each other. It always amazes me how different the responses from readers can be and what "they" take from what I write. I just wanted to clarify something... maybe you didn't read the parts of this blog that acknowledge that guys have their responsibility to help create the same loving environment for their wives where their needs are met as well. I certainly agree with all you have said to that effect! Of course marriage efforts should be reciprocal! As far as this blogs intentions... I am not trying to write to husbands about getting their act right as much as I am trying to get wives to because I am a women and I feel it is more effective for each group to focus on themselves more. Plus I mostly have a female audience. So it is awesome that you want to speak to the "husband" side of things... it indicates what a thoughtful man you are so nice hustle! And just to clarify. My husband doesn't keep things from me or sneak out of the house... he was just trying to avoid upsetting an already emotionally charged lady and was hoping for a very deserved day of entertainment. My husband is the most supportive, most thoughtful, and helpful man I have ever known. We are absolute equal partners both around the house, with the kids, and even our financial obligations. He treats me like a princess and we have a beautiful relationship. My story in this post was to help encourage people to look to changing themselves in life when you have interpersonal relationship issues- usually when you do you can unleash peace and happiness with others because they will be likely to follow your example. Thanks again for your ideas and for reading.